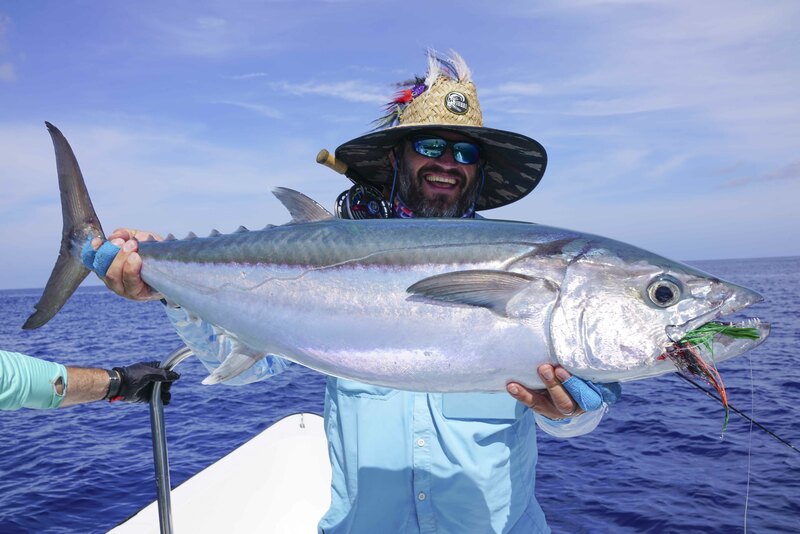 Cosmoledo Atoll Fishing News - 102 GT's in a Week! 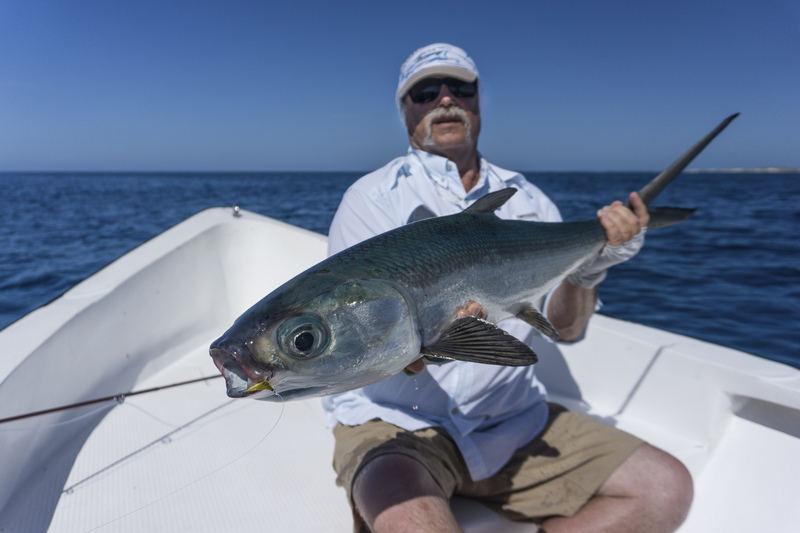 Some old friends of Alphonse Fishing Co. joined us this week on Cosmoledo. Ernest Cockrell, Phillip Davis, Michael Eklund, Edward Cappel, Charles McDaniel, Joseph Turano, Phillip Bendele, Randy and Lisa Cupp, Brent and Harriet Pennington and Meredith McCord got to enjoy the comforts of the Cosmoledo Eco Lodge. The group had some picture perfect weather predicted for the week with minimal wind, sunny skies and spring tides to kick things off. New to flats fishing, Brent and Harriet had the time of their lives! 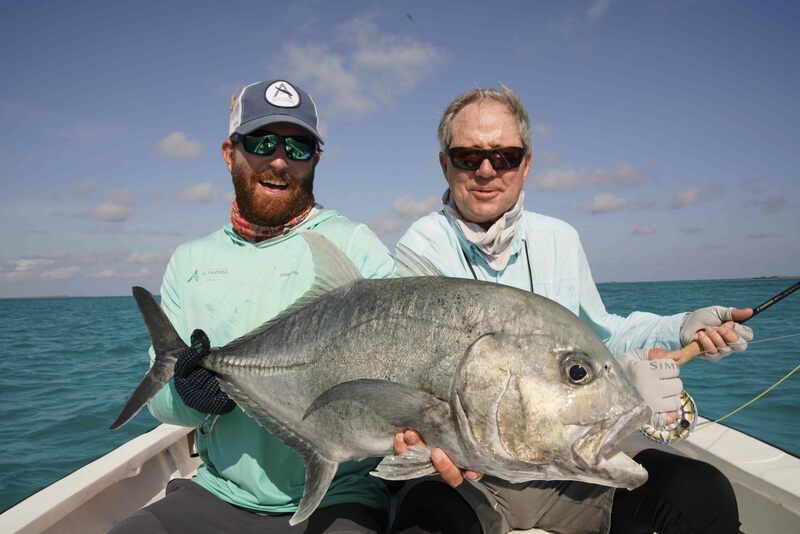 They each landed their first GT and Bonefish and Brent even managed to land a tricky Triggerfish, along with the rest of the crew who got stuck into the Triggerfish action. But it was Ernie who claimed the title of Triggerfish champion of the week. He landed an impressive 4 Triggers for the week. Randy certainly had a week to remember after landing a GT that measured 117 cm! 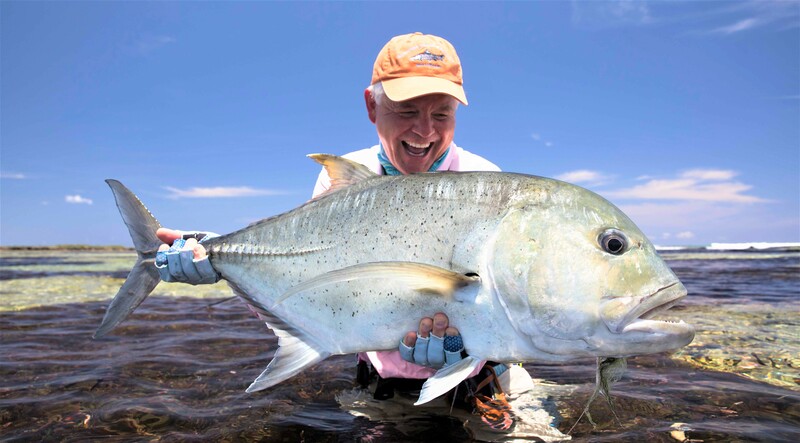 He added another fish of 106 cm to his tally later in the week as well as a 56 cm Moustache Triggerfish and ended off with the only Milkfish landed for the week. His wife, Lisa, had a great first trip out to Cosmo. Lisa landed her first GT on fly and a host of other species including a Giant Saddleback Grouper that nearly pulled her off her feet! 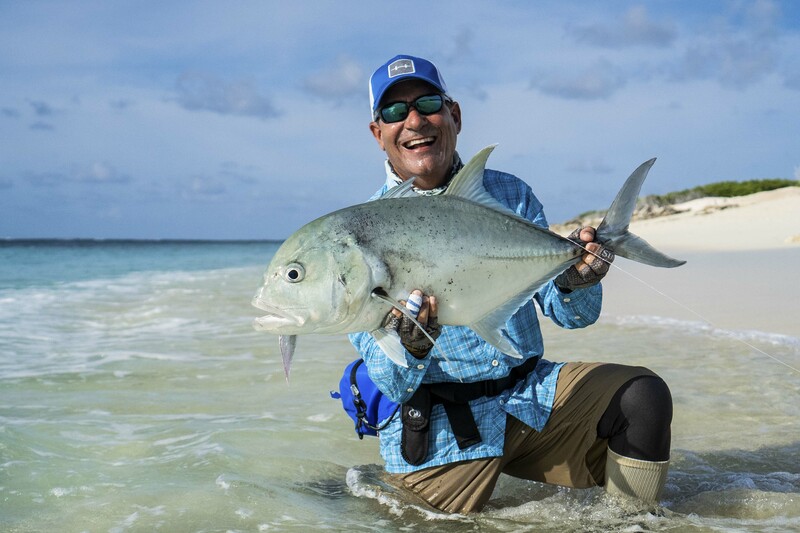 Michael made his final day on the flats count with two solid GT’s that cracked the magic one-meter mark, 100 cm and 103 cm respectively. But the big fish of the trip belonged to Joe. 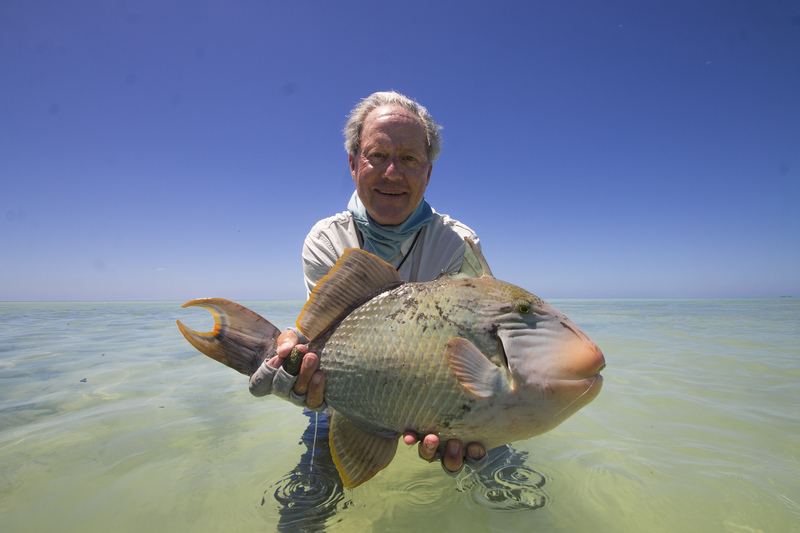 Not only did he land a 53 cm Triggerfish but his 121 cm GT was the talk of the camp. An absolute brute of a fish that was spotted cruising high in the channel and was intercepted with a popper. A fish of a lifetime! With so many great fish landed and so many more lost or missed the banter around camp was great. There is no question that the group made some great memories that will be relived for some time to come. 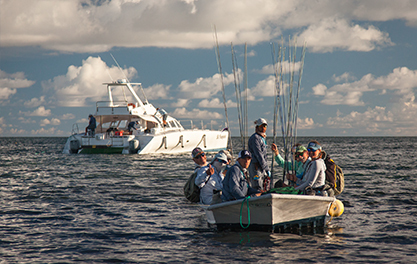 Tight Lines from the Alphonse Fishing Co. Guides on Cosmoledo Atoll!